If you visit the Royal Botanic Garden in Sydney, take a few minutes to look for a small bridge over a stream near the Wollemi Pine, ‘Australia’s homegrown Christmas tree’, close to the information booth. This is the Macquarie Culvert. The two brick arches were built as part of the construction of Mrs Macquarie’s Road, which Nicholas Delaney and his gang finished on her birthday in June 1816. They had a double purpose: a drain for the creek’s water, and a bridge. Built from sandstock brick, the culvert is both typical of early 19th-century drain construction and historically significant, the historian Anna Wong says. But at the end of the 20th century it was in a state of disrepair, with most of the mortar gone and a rare giant fern’s roots threatening to damage it further. And the original road was covered with two centuries’ worth of sediment. “It is one of the oldest-known sections of road in Sydney, but its existence surprised archaeologists and heritage architects from the Department of Public Works and Services when they began to dig,” says the Sydney Morning Herald. A joint team from the department and the RBG set out to conserve and restore Macquarie Culvert and the surface of the road Nicholas and his men laid nearly 200 years ago. Then the road was re-covered to preserve it for the future. Of course, it’s exciting for me as a descendant of Nicholas Delaney to know that his brick bridge still exists and has been restored, but how important is it as part of Australian history? As Anna Wong points out, “The age and material used within its historical context makes it a significant item. Other culverts and bridges were built during the early nineteenth century, but most have collapsed or were dismantled due to poor construction and inadequate knowledge. So – did Nicholas build the oldest bridge in Australia? The Richmond Bridge in Tasmania, convict-built between 1823-5, has a claim, and the Lennox Bridge, also called the Horseshoe Bridge, convict-built in 1832, is known as the oldest on the mainland. But Macquarie Culvert beats them both. True, it’s not so big or so well-known, but at a date of 1816 at the very latest, it is certainly the oldest surviving bridge in Australia. Not a bad achievement for an illiterate peasant and transported convict. When we were writing our book, A Rebel Hand: Nicholas Delaney of 1798, the reconstruction was still to take place and several of Nicholas’s descendants were lobbying for the preservation of the stretches of his original road that still existed. It exciting to think that this part is safe for at least the next 100 years, according to the Public Works and Services department. But here are some links to pictures of the culvert from Stone Mason & Artist, Oceanskies and zuctronic. 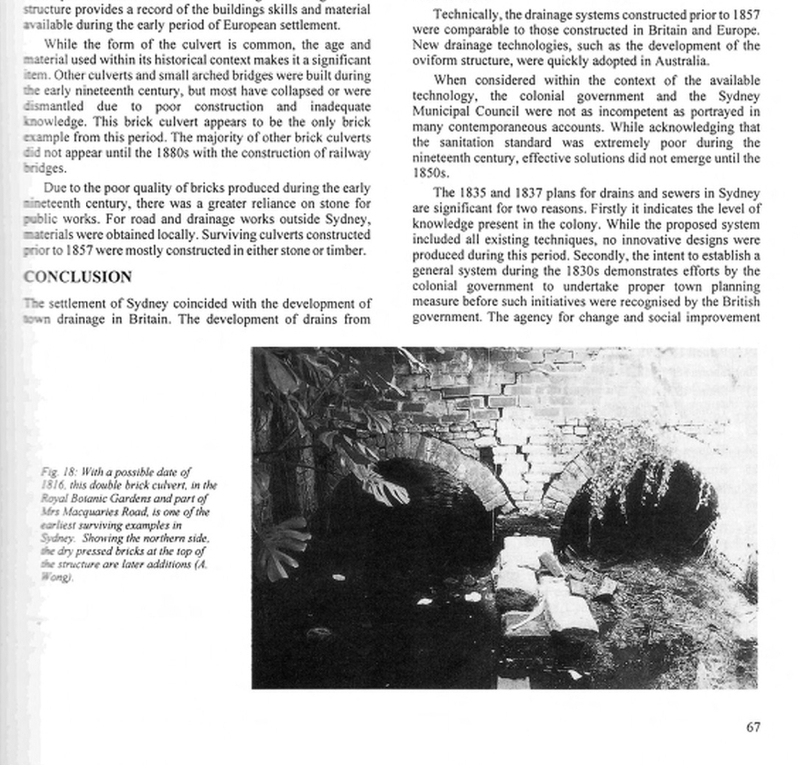 I found useful information about early nineteenth-century drains in Anna Wong’s paper in Australasian Historical Archaeology, 17, 1999 and about the restoration of Macquarie Culvert in James Woodford’s article in the Sydney Morning Herald of June 24, 2002. The AHA article also has an old photo of Macquarie Culvert before restoration. This entry was posted in Macquarie, Nicholas Delaney and tagged #Garden200, 1816, A Rebel Hand, Australia, Convict, Domain, Macquarie, NSW, Oldest bridge in Australia, Royal Botanic Garden, Royal Botanic Garden Sydney, Sydney. Bookmark the permalink. 10 Responses to Did Nicholas build the oldest bridge in Australia? Thanks for reblogging! I’m looking forward to reading your blog. What a lovely neat little bridge – and a clever piece of planning to get it finished on Mrs Macquarie’s birthday! So glad they have been able to restore it. Yes, I think some careful calculation went into that special birthday present. They were well rewarded – Nicholas and his 10 men were given five gallons of rum as a thank-you, and rum wasn’t just booze, it was used as currency, too. That must have been quite a party. I have an ambition to go and see the culvert during the RBG’s bicentenary in 2016.